Ever wondered how your sweet tooth evolved? Go ahead and thank Mother Nature. As it turns out, human taste buds are hardwired to appreciate sweet foods from the moment that weâ€™re born, a fact that is no more evident than when a child samples a piece of birthday cake for the very first time. From the flash of sheer delight that spreads across a sugar newbieâ€™s face to their ebullient demeanor, confections really are capable of taming the savage beast… er, adorable cherub-faced bundle of joy. You probably wouldnâ€™t want to placate your mini-me with one of the twelve pieces inside Seeâ€™s Easter Traditions Box for fear that it could lead to unreasonable dietary demands such as the lofty expectation of a 100% Seeâ€™s chocolate smorgasbord in exchange for one fewer temper tantrum per week. Presenting this nifty little collection to a colleague, friend, or Easter-brunch hosting family member, however, could easily turn all tides in your favor, especially if you need to symbolically and/or sugarifically right a wrong. 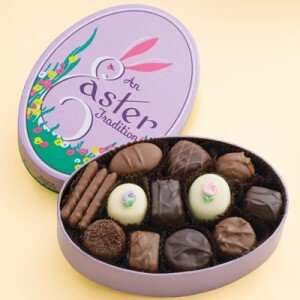 On the surface, Seeâ€™s 12 piece Easter Traditions Box may seem modest in size, but once you remove its oval-shaped, violet-tinted lid, youâ€™ll be immediately impressed by how much sugary goodness is packed inside. Containing 8.7 ounces of actual product — the equivalent of 12 individual chocolate-covered pieces (technically 14 if you count the three milk molasses chips as separate entities) – youâ€™ll be getting real value for the $12.55 that you spend. Decoding the actual treats within does require a sharply tuned eye as well as the ability to compare Seeâ€™s master chocolate photographs/descriptions located on their website to what your particular selection offers. I can only guess that they are intentionally vague about the contents of their Easter Traditions Box in order to ensure flexibility if and when they run out of certain pieces. Vanilla Nut Cream: A soft vanilla cream center studded with walnuts and enrobed in milk chocolate. Milk Molasses Chips: Crisp molasses-infused toffee dipped in milk chocolate. Milk Bordeaux: A brown sugar-flavored cream blanketed in milk chocolate and accented with with chocolate vermicelli. Milk Chocolate Butter: A chocolate based cream center enriched with butter and coated inâ€¦yupâ€¦milk chocolate. Dark Butterchew: Basically a chewy vanilla and brown sugar tinged caramel with a dark chocolate shell. Caramel: Maple, brown sugar, and butter do the tango in this crowd-pleasing, almond studded, milk chocolate-dipped caramel. Scotchmallow: One of Seeâ€™s most frequently demanded treats, this marshmallow and caramel layered confection rightfully rocks a dark chocolate exterior. Divinity: This is what happens when marshmallow fluff collides with walnuts and milk chocolate â€“ a bite size Sâ€™mores without the graham foil. CafÃ© Au Lait Truffle: White chocolate ganache jazzed up with java and dipped in milk chocolate. White Chocolate Covered Raspberry Truffle and Lemon Truffle: All dressed up in their white Easter finery, both flower-adorned selections boast a white chocolate based ganache enhanced with real fruit puree and bright flavors. Those with Rainman sensibilities will notice that I failed to include a description of the final piece included in my Easter Traditions Box. Despite double-checking Seeâ€™s website 63 times and cross referencing what I saw online with the real live chocolates staring back at me, I couldnâ€™t discern the difference either visually or flavor-wise. When purchasing an Easter or spring-themed collection, am I the only one who eagerly anticipates indulging in seasonally-inspired flavors? I didnâ€™t think so. Given that a mere 16.7% of Seeâ€™s Easter Traditions Box consists of such legitimately festive offerings, I think that their master confectioner could easily step up their game by stepping a few feet away from their current chocolate comfort zone. This sounds like a great gift for someone like you mentioned. Maybe not for younger children since they might not appreciate the variety. Your article is fun to read and I like that you added the candy descriptions – it’s almost as good as tasting them!